Forni Fiorini Bakery Annular Steam Tubes Deck Oven TA Our range of Commercial Deck Ovens is suitable for bakery, confectionery, patisserie and pastry shop use. The heavy duty professional electric deck ovens also known as bread oven are the baker's favourite equipment, either diesel or gas powered are perfect for baking in the professional kitchen, also at the best prices in the UKTECHNICAL DETAILS Independent and watertight baking chambers, all of which are equipped with double steam generators (excluded mod. TA82). Combustion chamber made of thick refractory steel. Stainless steel front section; lateral and back covering made of galvanized pre-coated sheet panels. High thermal insulating lagging. Quick assembly and starting up as well as easy handling of the oven. Baking surfaces made of refractory material with a wire mesh support grid. Balanced oven doors made of tempered plate glass with opening from the top to the bottom, easily removable to facilitate cleaning operations. Steam exhaust valves operated from the front side, under the hood. Electro-steam exhauster included. All parts are accessible from the oven front side/top to allow for easy maintenance OPTIONAL: Static recovery chamber. Baking chamber with useful height of 24 cm. Additional steam generators on fumes circulation. External stainless-steel panels..
Forni Fiorini Deck Oven Simply 2T Our range of Commercial Deck Ovens is suitable for bakery, confectionery, patisserie and pastry shop use. The heavy duty professional electric deck ovens also known as bread oven are the baker's favourite equipment, either diesel or gas powered are perfect for baking in the professional kitchen, also at the best prices in the UKTECHINICAL DETAILSElectric oven with refractory floor of independent and stacked rooms. Available with 1, 2, 3 or 4 baking levels, independent baking chambers with computerized controls for all the functions of the oven. The baking floor is made of refractory material. face and external panels in stainless steel; steam valve for each room; refractory floor for cooking with or without trays; retractable glass doors opening up to the high; high-grade insulation panels thanks to compressed rock wool panels; Electronic digital controller with: · economizer · automatic oven starting · ceiling and floor temperature control with double thermostat and double probe · buzzer for cooking end · 8 cooking programs available; heating generated by electrical heating elements in stainless steel. OPTIONAL: proofer or base steam suction in the hood kit of wheels for proofer or base baking chamber with useful height of 24 cm ( H ext. 42 cm )..
Forni Fiorini Deck Oven Simply 4T Our range of Commercial Deck Ovens is suitable for bakery, confectionery, patisserie and pastry shop use. The heavy duty professional electric deck ovens also known as bread oven are the baker's favourite equipment, either diesel or gas powered are perfect for baking in the professional kitchen, also at the best prices in the UKTECHINICAL DETAILSElectric oven with refractory floor of independent and stacked rooms. Available with 1, 2, 3 or 4 baking levels, independent baking chambers with computerized controls for all the functions of the oven. The baking floor is made of refractory material. 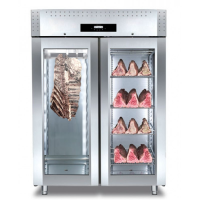 face and external panels in stainless steel; steam valve for each room; refractory floor for cooking with or without trays; retractable glass doors opening up to the high; high-grade insulation panels thanks to compressed rock wool panels; Electronic digital controller with: · economizer · automatic oven starting · ceiling and floor temperature control with double thermostat and double probe · buzzer for cooking end · 8 cooking programs available; heating generated by electrical heating elements in stainless steel. OPTIONAL: proofer or base steam suction in the hood kit of wheels for proofer or base baking chamber with useful height of 24 cm (H ext. 42 cm ) ..
Forni Fiorini Electric Deck OvenOur range of Commercial Deck Ovens is suitable for bakery, confectionery, patisserie and pastry shop use. The heavy duty professional electric deck ovens also known as bread oven are the baker's favourite equipment, either diesel or gas powered are perfect for baking in the professional kitchen, also at the best prices in the UKTECHNICAL DETAILSThanks to excellent baking quality, production flexibility, simple use and installation, our electric ovens meet perfectly the new demand from the bakery and confectionery business. Each chamber is fully independent from the others. Electronic digital controller with: - economizer - automatic oven starting; - ceiling and floor temperature control with double thermostat and double probe; - independent control for steam heating element; - buzzer for cooking end; - 9 cooking programs available. Stainless steel front section; lateral and back covering made of galvanized precoated sheet panels. Independent steam injection for each deck thanks to high performance steamers. Independent steam exhausting valve in each chamber. High thermal insulating. Baking surface made of refractory material OPTIONAL: Baking chamber with useful height of cm 23 or 28. External stainless-steel panels. ..
Forni Fiorini Electric | Gas Deck Modular Oven Our range of Commercial Deck Ovens is suitable for bakery, confectionery, patisserie and pastry shop use. The heavy duty professional electric deck ovens also known as bread oven are the baker's favourite equipment, either diesel or gas powered are perfect for baking in the professional kitchen, also at the best prices in the UKFeatures: Aluminised metal baking chambers and refractory baking deck or embossed sheet steel deck. Electronic temperature regulation. Baking directly on deck or in trays. Modular to suit various needs. Fully independent chambers. Heavy duty heating elements in ceiling and deck. Also available with steamer. Ergonomic downward-opening door. Provided with one safety thermostat. Available with prover or tray-holder stand. OPTIONAL: Baking chamber with useful height of cm 23 or 28. External stainless-steel panels. ..
Forni Fiorini Bakery Wood Deck Oven Our range of Commercial Deck Ovens is suitable for bakery, confectionery, patisserie and pastry shop use. The heavy duty professional electric deck ovens also known as bread oven are the baker's favourite equipment, either diesel or gas powered are perfect for baking in the professional kitchen, also at the best prices in the UKTECHINICAL DETAILSThe W series is the excellence of traditional ovens, with refractory brick channels and cement furnace. Thanks to the high thermal mass, it’s the best oven for medium/big size bread cooking and for all the type of products that require high heat from the floor and a lot of steam. It can work with gas, diesel oil, pellet or wood. Oven at 3 or 4 baking chambers. Equipped with one steamer for each deck placed on fumes circulation Furnace in cement and refractory material assembled on site that gives to the oven a large thermal power. Manesman heating pipes, resistant to high pressure, double cross for floor and top, with an external diameter of 27 mm and thickness of 4 mm Stainless steel front section; lateral and back covering made of galvanized pre-coated sheet panels. High thermal insulating with a layer of glass wool in order to prevent heat dispersion Baking surfaces, made of refractory material with a wire mesh support grid, allow remarkable thermal accumulation and equal distribution of heat. Balanced oven doors made of tempered glass plate with opening from the bottom to the top which are easily removable to facilitate cleaning operations. Steam exhaust valves can be operated from the front side Lights are located on the sides of the baking chambers in an easy to reach position. Steam exhauster included. All oven parts accessible from the front or top side to allow easy maintenance. OPTIONAL: Baking chamber with useful height of 24 cm. External stainless-steel panels. Right side furnace to be used with solid fuels. Automatic switching on of the oven + motorized chimney damper. Adjustable motor exhauster speed with inverter..